"A much needed revamp of an ageing OS." When I first sat down to write this review, I was going to label it as “Kinda Awesome”, simply because I felt that I couldn’t justify calling a software update “Awesome”. After thinking it through, however, I felt that – when looked at merely in the realm of software updates – iOS 7 was deserving of that accolade, as it both brings a much needed fresh feel to what was rapidly becoming an out-dated interface, and adds some impressive functionality that will help Apple keep its spot as one of the dominant smartphone makers in the market. Released on the 18th, this is the first iPhone software update from Apple that actually significantly changes things. The changes have brought somewhat mixed reviews, but from my personal standpoint, and from my experience hearing others feedback, feelings are mostly positive. There are, of course, those that bemoan the changes, but honestly, it feels like they are the kind of people that just don’t feel comfortable with change in general. I’ll start with the first thing you notice upon updating – the lock screen. Gone is the big slide to unlock button, replaced now with a minimalist swipe arrow and a swish animation to reveal the passcode entry screen. Most importantly, however, is the ability to access the control and notification centres (as well as still being able to access the camera) without having to unlock. 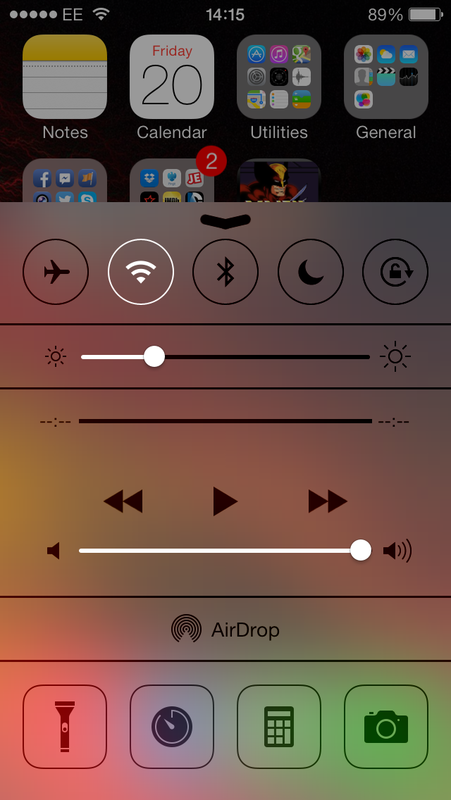 I’ll get on to the control centre later, as that’s one of my favourite things about this update. Once into the home screen, you see what is the source of most of the complaints about this update – the aesthetics changes. Gone are the glossy, 3D effect buttons, replaced by bold colours and strong lines. I’ve heard people say it looks like a childs toy phone, and I have to admit at first I found it somewhat jarring, but after playing around with it for a while, I quickly acclimatised to it and, in fact, am enjoying it more. It just seems a lot cleaner and smarter, and, as many have been saying, almost looks and feels like a new phone. There are plenty of other aesthetic changes to be found, other than the 2D bold and sharp schemes. The folder animations, for instance, have been changed, and thank the Lord. Now, when opening folders, a smooth animation brings the folder to full screen mode, rather than that ugly little drop down box before. 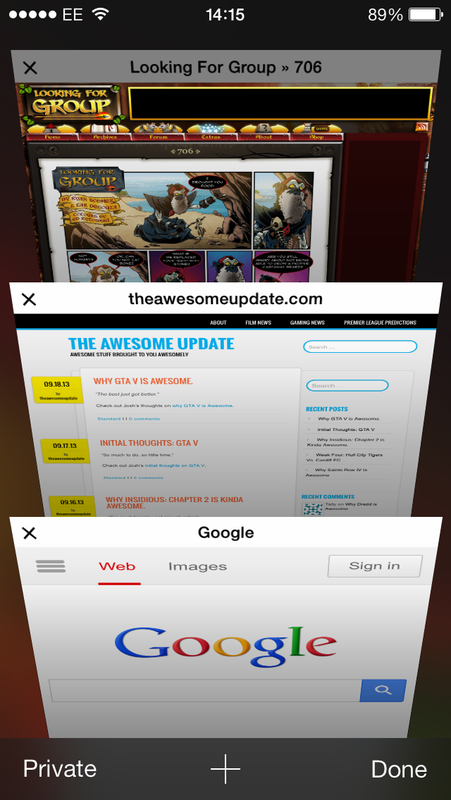 The page browser on Safari is now a 3D view seemingly designed to emulate flicking through folders in a filing cabinet, and looks miles better for it. The camera also has a simple and easily managed aesthetic that eschews a few buttons for swipe functionality. Speaking of functionality, let’s take a look at what this update adds. There are a few minor, but welcome additions, like camera filters for all those wannabe photographers on instagram; increased functionality to the notification centre that somehow makes it much easier to navigate and organise; the ability to set apps to auto-update (! ); and, crucially, the addition of a “preview” screen on the multi-tasking bar that allows you to both see what the last screen of a program looked like, and to easily close programs with a simple swipe. Yet another cool addition with the iOS 7.0 is a function called AirDrop, already seen on the Mac, that allows users on the same network (or, if you want to restrict it, just your contacts on the same network) to quickly and easily share files when connected via a wireless network or bluetooth. The big addition for me, however, is the control centre, accessed by swiping up from the bottom of the screen (as opposed to down from the top for the notification centre), and this gives you quick and easy access to a myriad of common functions, including: airplane mode, wifi, bluetooth, do not disturb, potrait orientation, music player, flashlight, timer/clock, calculator and camera. Not having to go into a folder, or into settings and relevant sub categories to access these functions is a real boon, especially when it can be accessed from the lock screen. Even now, only 2 days later, I cannot truly emphasise how much easier this one addition has improved my use of the phone. 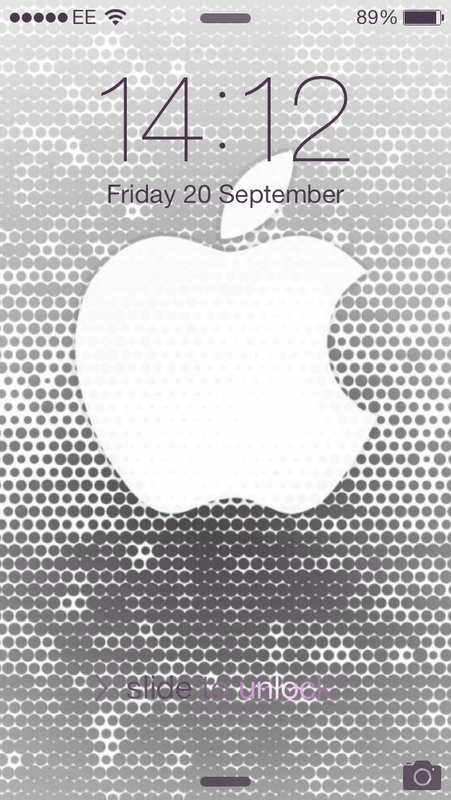 I could go on, as there are other additions, tweaks and changes that iOS 7 brings, but I think you get the picture. All in all, this is a great software update, and if you haven’t got it yet, do so. Well played, Apple. Until next time, this has been Blacksmith, writing for the Awesome Update.